Axe Master Redemption Game from Sega, the company that brought you the Megahit, Award Winning High Value Prize Vending Game, proudly introduces this exciting new prize redemption game! In Axe Master players line up the Axe to chop the log and win a prize! Axe master features a brightly lit cabinet with simple to play buttons controls, prize shelves that make refilling easy and is coin / DBA / Swipe Card ready. Game play is easy, players must use the left and right buttons to position the axe. They then move it up to the desired prize level and release to chop with your axe. If the axe hits the target, the player wins a prize. The simple gameplay coupled with an attractive cabinet will draw players of all ages and skill levels across the floor. The opportunity to win big will also encourage repeat play. 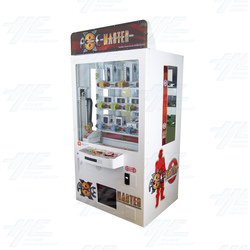 Axe master features a brightly lit cabinet with simple to play buttons controls, prize shelves that make refilling easy and is coin / DBA / Swipe Card ready. Game play is easy, players must use the left and right buttons to position the axe. They then move it up to the desired prize level and release to chop with your axe. If the axe hits the target, the player wins a prize. The simple gameplay coupled with an attractive cabinet will draw players of all ages and skill levels across the floor. The opportunity to win big will also encourage repeat play.